One going begging … nibbles in the atmospheric Cantinone-già Schiavi. It was an inspired choice. It turns out we weren’t eating tapas (“We don’t use the T-word here,” said the waiter) but cichèti, small snacks unique to the bars of Venice. Our conversation, usually dominated by football, turned to the tenderness of sliced flank steak and the sweet softness of the sensational cuttlefish cooked in its own ink. On more than 20 visits to Venice, Polpo owner Russell Norman has trawled the back-street bàcari, the small bars where locals pop in for a glass of wine and a snack, to find inspiration for Polpo. He is the right man to talk to about where to eat in what he calls “one of the world’s worst destinations for food lovers”. “Avoid all the crappy tourist places,” is Norman’s advice, “anywhere with the menu in six languages stuck in the window or, worse still, one with photographs of lurid pizzas. Cutting edge … La Cantina. 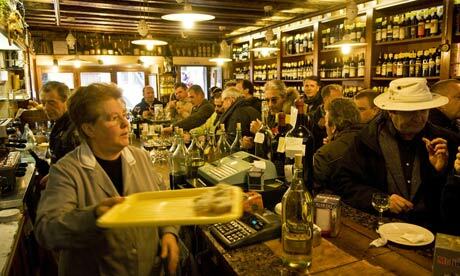 Photograph: Gavin McOwan A bar crawl, or giro di òmbre, is the best way to try Venice’s bàcari, popping into each for a cichèti and accompanying òmbra (small glass of wine). And a good place to start was Ca’ d’Oro – Alla Vedova (Cannaregio 3912, Ramo Ca’ d’Oro), one of the best-known bàcari, on the Strada Nuova, well away from the city’s touristy hub. On a Friday night it was packed with punters lingering around the bar, waiting for the hot polpette (pork rissoles) to emerge from the kitchen. These delicious balls of salty, finely minced pork (the inspiration for the meatballs at Polpo) were snapped up within seconds of hitting the old marble bar counter, washed down by unbottled Veneto red in tiny glasses. Both cost €1 a pop. Across the iconic Rialto bridge, on the other side of the Grand Canal and tucked down an alleyway, is tiny All’ Arco (Calle Arco, San Polo 436, lunchtime only). On a Saturday lunchtime this friendly bàcaro was heaving with shoppers from the nearby Rialto market, which sells a stunning selection of fresh fish and remains a favourite meeting place for Venetians. Plates of cichèti on the bar – langoustines, calamari, liver, speck and prawns, all served on slices of bread – were tasty enough, but what the owner Francesco Pinto was preparing behind it looked even more appetising. The hot sandwich of boiled beef sausages (which, he gesticulated, are made from the meat in the cow’s head) served with mustard was the perfect winter comfort food. Water to wine … Cantinone-già Schiavi. Opposite Cantinone–già Schiavi (992 Ponte San Trovaso), located on a canal in Dorsoduro, is another symbol of disappearing Venice: one of the city’s last gondola workshops. Schiavi is really a wine shop that sells food on the side – although the cheese and fennel crostini were delicious. The walls are covered floor to ceiling by bottles, and there is a fantastic choice of 10 or so wines by the glass, mostly from the Veneto region, starting at €2. That, I noted, was the same price as the house, so I made a pest of myself and started to work through the labels (well, the glasses are tiny). Venice is notorious for its lack of nightlife, but a good place to end a bar crawl is Campo Santa Margarita, the hangout for local and international students. Ai Do Draghi, at the north end of the square and known as the red house as much for its political leaning as for the colour of the facade, was swarming when I arrived. Like me, the cichèti were looking a little tired and dog-eared by late evening, so I ended the night with their excellent spritz, the classic Venetian cocktail (whose recipe Norman admits to nicking for Polpo).